Harlo! I'm back. I was busy with my ROM previously. After a week away from my laptop, I am finally back updating my blog (all the posts you read before this were scheduled way before my ROM, I am a responsible blogger okay). 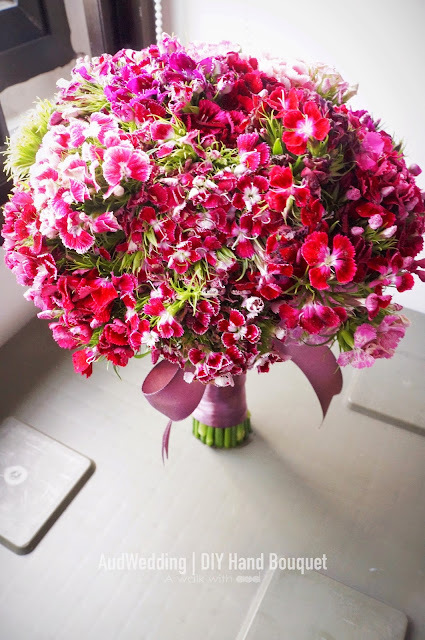 Back to my ROM, initially I never thought of having a bouquet but Shavin (kareshi's younger sister) says I should have one and insisted her brother to get one for me. 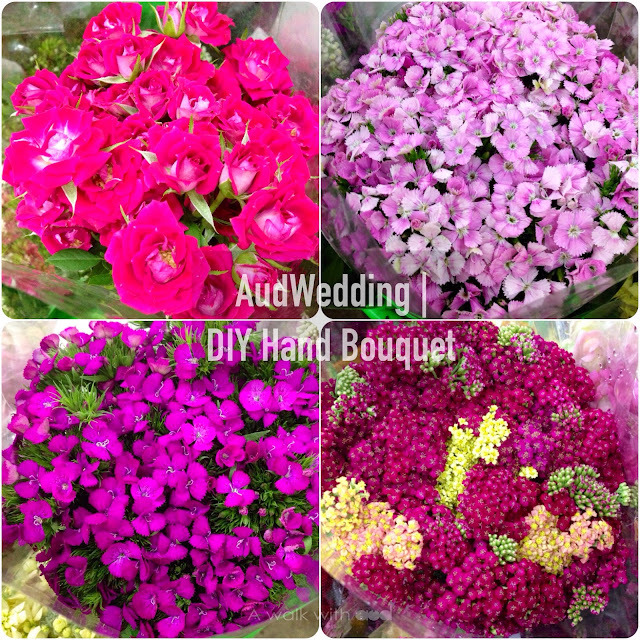 Two days before our ROM, we went to florist to check it out but none of them fit to our liking and oh my god it's way too expensive. 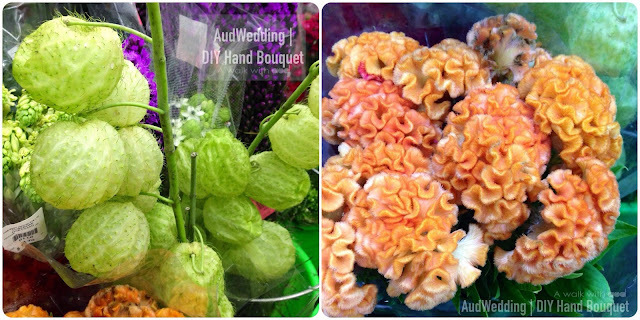 I never knew a hand bouquet could be so expensive. I am not a flower person that's why I really don't find it necessary or worthy to spend so much on flowers. 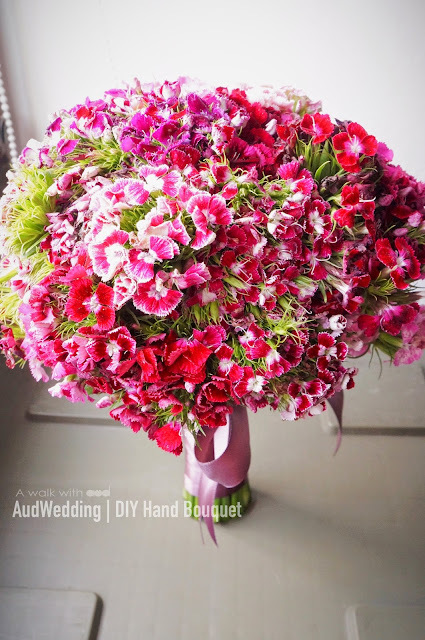 Hence, hand bouquet from florist was a no. We continued walking around and found ourselves at the fresh cut area where you can get all sorts of fresh cut flowers. Sudden thought: "Hey, why not make one ourselves!" 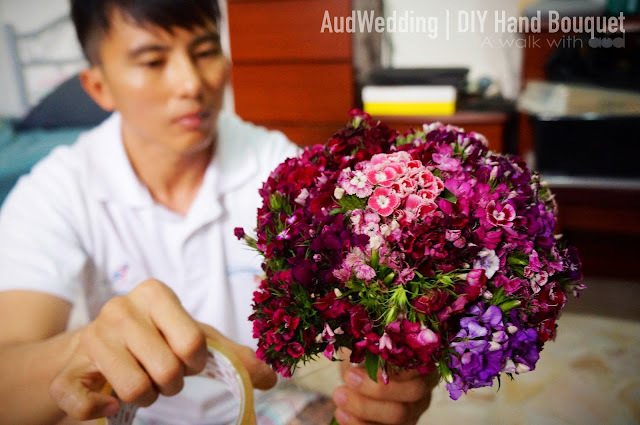 When we decided to make a hand bouquet ourselves, we have a clearer picture on what we should look out for. I like baby's breath, initially I thought of using just baby's breath as bouquet but kareshi said it will be quite plain as our outfit will be white so we decided to search for other alternatives. There were so many types of flower that I couldn't call their names. We even found some that look extremely weird. The one on the right definitely looks like brain. 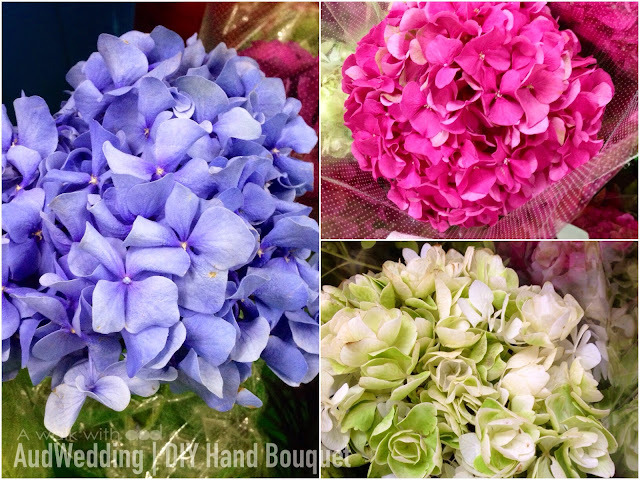 When I saw Hydrangea, I fell in love. It's really very lovely but at the end I decided not to take it. Save it for my actual Chinese customary (maybe) because something else had caught our attention. The Dianthus Barbatus. I am not sure what kind of flower is this but they look lovely in a bunch. The one of the left is more reddish/ pinkish, whereas the one of the right has more purple shades. We decided on the right because the color goes better with the ribbon we have. 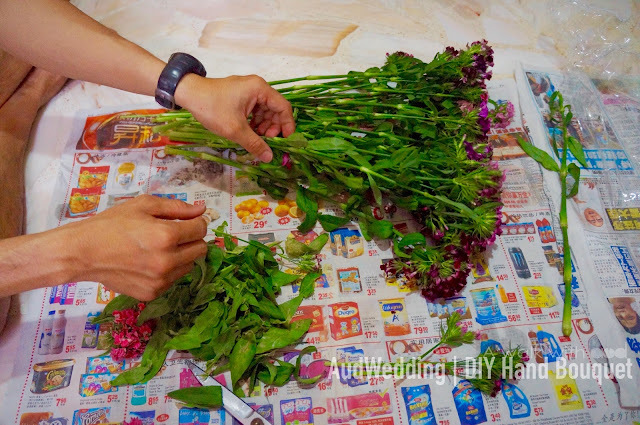 Now that we've got the flowers, let's start the DIY process. First, clean away the leaves. Keep only the top layer to add volume to the overall look. 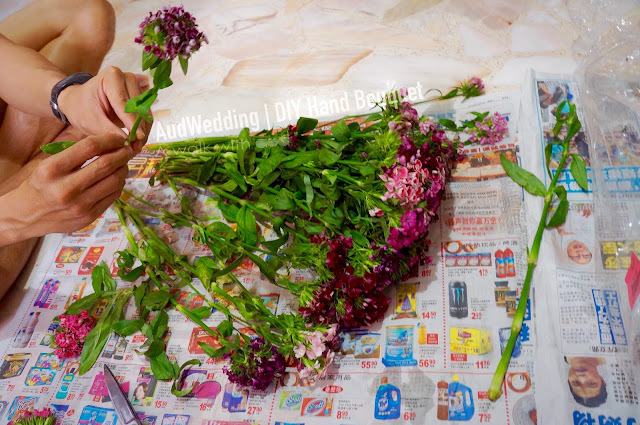 Rearrange the flowers and chopped the stems to your preferable length. Tape the flowers nicely. It has to be tight enough to form a nice shape. 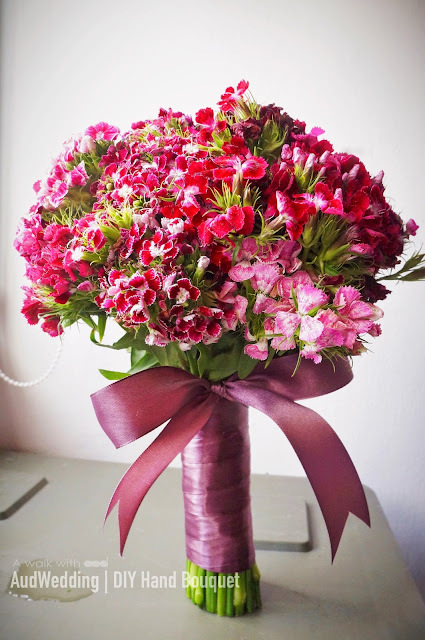 This flower tends to break off easily hence extra care is needed. Sadly we broke quite a few. After securing the flowers, time to wrap it with ribbon to finish the look. There you go. 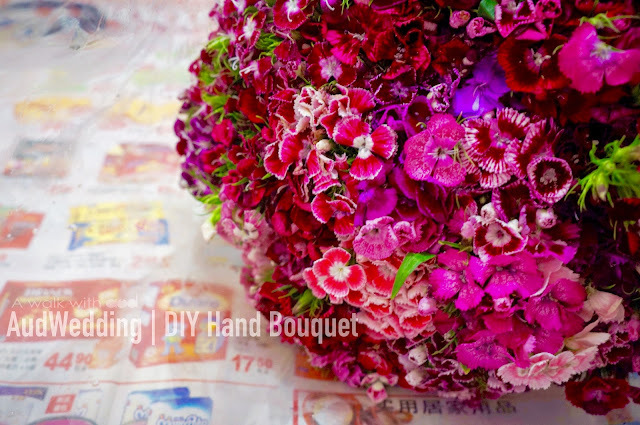 My DIY hand bouquet for R.O.M made by Kareshi. How did we score? Although the shape was not round enough (due to some flower breakage) but its not too bad for the first time I would say. It's lovely isn't it? I love the raw finishing. It looks clean and gorgeous. Some how it looks more reddish under natural sun light. 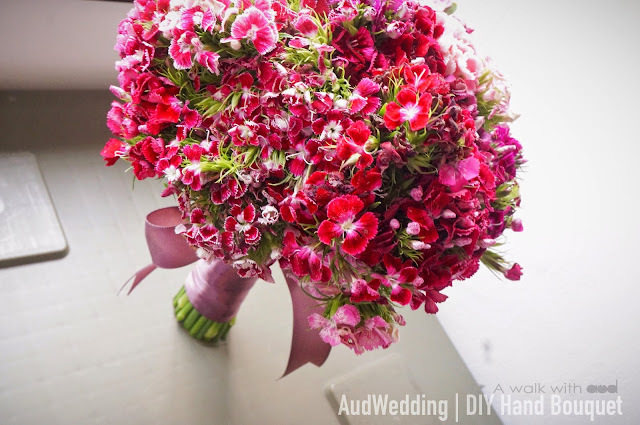 People were asking how much can I save for DIY the bouquet. Why go through the trouble? Well, quite a big sum I would say. 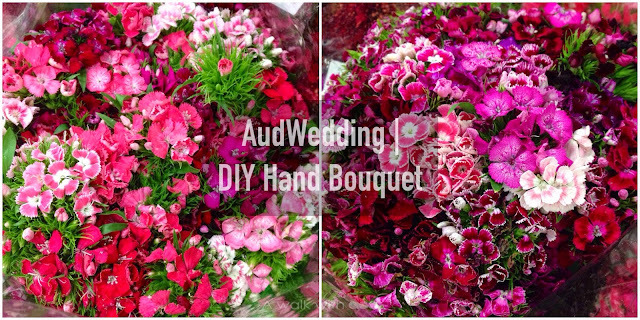 A bridal hand bouquet from florist, $117 (Hydrangea with baby's breath), whereas this lovely DIY hand bouquet, $16.85 ($12.85 for flowers, $4 for a roll of ribbon). Total saving: $100.15. Honestly, it is not so much on the saving but the joy we had. 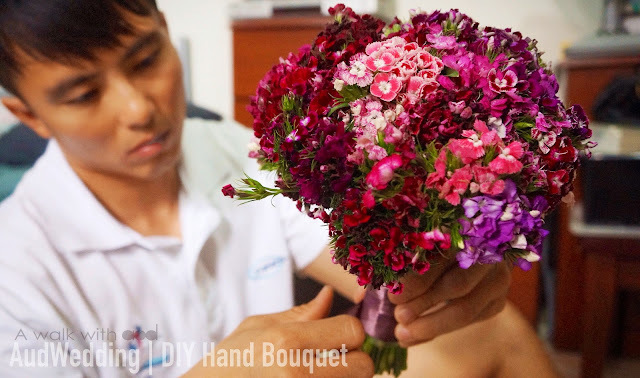 I am glad that we decided to make our own bouquet because I love how it turns out and I love the fact that both of us were so involved. It is easy to just pay and buy but we prefer to spend time and get our hands dirty so we could go through the process and have fun together. It is more meaningful that way. Hope you love it as much as we enjoy making it.